Tucson's rather dispersed downtown district occupies several dozen blocks between I-10 and Hwy 220, while another major center is a short distance northeast, around the University of Arizona campus, where locations include Arizona State Museum, Arizona Stadium and the University of Arizona Medical Center. Most shops and hotels are along the I-10 corridor, which together with the adjacent Santa Cruz River forms a natural western boundary; beyond are scattered residential estates between patches of undeveloped desert, and a few natural areas like Sentinel Peak Park. The best way to experience the scenery, plants and wildlife of this part of Arizona is by visiting Arizona-Sonora Desert Museum and Saguaro National Park (west section), both just 15 miles from the city center. Tucson's JW Marriott Starr Pass Resort has one of the best locations for any hotel in the state, a few miles west of the city center in the saguaro-covered foothills of the Tucson Mountains, surrounded by pristine Sonoran Desert landscapes; several hiking trails begin just across the road. The resort provides comprehensive facilities for families, business and leisure travelers; highlights are a golf course, a large outdoor pool complex (including fountains, water slide and lazy river), the Hashani Spa and 88,000 sq ft of meeting space, both indoor & outdoor. The luxurious accommodation comprises 540 rooms and 35 suites, all with beautiful views of the mountains or the distant city. Six dining outlets serve food and drink for all occasions. As its name suggests, the full service Marriott Tucson University Park sits at the edge of the University of Arizona campus along Euclid Avenue, right in the middle of downtown Tucson and so within walking distance of numerous shops, bars, restaurants, museums and theaters. The international airport is 12 miles south. The Marriott is a large hotel of 9 floors and 250 rooms - all large, comfortable and well equipped, if a little dated. The on site restaurant is Saguaro Grill, open for breakfast, lunch & dinner; other facilities include a huge atrium lobby, outdoor pool/whirlpool, fitness center, business center and nearly 12,000 sq ft of meeting/banquet space. Open late 2017, the newly constructed, 136 room AC Hotel has a fine location in downtown Tucson along Broadway Boulevard, less than one mile from Interstate 10, and within walking distance of many restaurants, bars and other attractions. The Tucson Streetcar stops right outside, enabling quick travel to places in the vicinity, from the Mercardo District in the west to the university campus in the east. Hotel highlights include a rooftop pool, a large fitness center, valet service, meeting space and a full restaurant/bar, which features local cuisine and craft beers. Artwork in the lobby reflects the landscapes and culture of southern Arizona. The Hyatt Place is a relatively central Tucson hotel, located at the Grant Road exit of I-10, in a business district though close to a few restaurants. The nearest supermarket (Safeway) is one mile west. The hotel occupies an older building of five floors and 92 guest rooms, set back slightly from the road behind a gas station; facilities include a business center, boardroom, fitness center and an outdoor pool, on the sunny south side. Food/beverage facilities comprise a bar, a cafe, and a 24 hour market selling drinks and snacks. 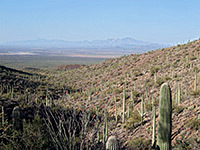 The hotel is 12 miles from the popular Arizona-Sonora Desert Museum. Clarion Inn Tucson occupies a large, easily reached site right next to interstate 10 (exits 259 & 260), close to the edge of the city - the saguaro-covered slopes of Sentinel Peak rise up a few blocks west, while Gates Pass and Tucson Mountain Park are 8 miles further. The hotel has 98 interior corridor rooms, in several blocks around the central pool area, with a restaurant on site and all the other usual facilities including a business center, fitness center, laundry, hot tub and meeting space. Free continental breakfast is served. A short distance northwest of downtown Tucson, the new Holiday Inn Express Tucson has an easily-reached location 0.4 miles from exit 256 of I-10, along Grants Road - part of a small lodging/dining complex in an otherwise industrial neighborhood. The front of the hotel overlooks the (usually dry) Santa Cruz River. 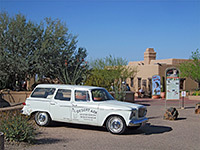 The inn is one of the closest hotels to the west section of Saguaro National Park as well as other nearby attractions including Old Tucson Studios, Silverbell Golf Course and the Tucson Convention Center. The free Express Start continental breakfast is served each morning; the other main amenities are an outdoor pool, whirlpool, guest laundry and a business center. The Best Western Royal Sun Inn has a north central Tucson location on Stone Avenue, opposite De Anza Park. Although not in the best part of town, the hotel has well maintained grounds including fountains and a fish pond, all lined by saguaro and palm trees; it features an on-site bar/restaurant/lounge, outdoor pool, hot tub and exercise facility. The nearest interstate is I-10; the hotel is less than a mile east of exit 257, along Speedway Boulevard. Complimentary full breakfast is served. Newly converted from another brand, Comfort Inn Tucson offers 67 clean, medium sized guest rooms, all equipped with microwave, refrigerator and pillow top mattress. Some have a hot tub and extra sofa bed. East-facing rooms look out over the Santa Cruz River and to I-10 which runs past just beyond; those on the west side have views towards the saguaro-covered Tucson Mountains. The hotel serves free continental breakfast and is close to a fair selection of restaurants, around exit 256 of the interstate (Grant Road). Also available are a nice outdoor pool/hot tub, a fitness center, business center and a convenience store. Quality Inn Flamingo enjoys a central location just off Speedway Boulevard, which puts guests within a few miles of University of Arizona, Pima Community College and Tucson Convention Center, while other places are easily reachable by I-10 which runs past a few blocks west. The inn has 80 exterior corridor rooms (equipped with microwave, refrigerator & flat screen TV), in three blocks enclosing the central parking lot, with a nice outdoor pool at one corner. Other services are free continental breakfast, a hot tub and an exercise room. Ramada Tucson has busy surroundings at the front, as it faces the western I-10 frontage road, but is much more peaceful at the rear, where rooms have views of the (usually dry) Santa Cruz River, and beyond to the saguaro-studded hills of Sentinel Peak Park. The Arizona-Sonora Desert Museum is 13 miles west, at the edge of Saguaro National Park, while many city center locations are served by the Tucson Streetcar, which stops at the hotel entrance. The Ramada is centered on a secluded courtyard garden with pool, sundeck and sports courts; it also offers a fitness center, meeting space, cafe and bar. The Days Inn near downtown Tucson is bordered by I-10 to the east and the Santa Cruz River to the west; rooms at the rear have views across the sandy streamway and the residential district beyond to the Tucson Mountains. The city center and the University of Arizona are just a couple of miles away. The exterior corridor hotel has an outdoor pool at the front, tucked away in one corner of the parking lot, and it provides the standard amenities of free continental breakfast, free wi-fi and a refrigerator/microwave in each guest room. Some accommodations contain a kitchenette. The Travelodge is part of a group of affordable motels near the Starr Pass Boulevard exit of I-10 (west side), a couple of miles from the city center. Although rather old, the building has interior corridors and rooms face north or south, away from the interstate; amenities are free continental breakfast, coin-operated laundry, free wi-fi and a microwave/refrigerator in all guest accommodations. A small selection of restaurants are within walking distance. Econo Lodge Tucson is a typically small, budget-priced, exterior corridor establishment of 48 rooms, arranged around three sides of the rather limited parking lot, and located at the intersection of Speedway Boulevard and Stone Avenue a little way north of the city center. An outdoor pool is the main amenity, together with the usual free wi-fi and free continental breakfast. Some rooms contain a refrigerator. There are several restaurants nearby, but a much better choice can be found one mile away along 4th Avenue. Super 8 Tucson has a peaceful location on the west side of the Santa Cruz River, easily accessed from I-10 (the Grant Road exit), but far enough away - 0.3 miles - to avoid the traffic noise. The two floor property is of older construction, with exterior corridors, but it enjoys a good reputation for value and cleanliness. Amenities are limited to guest laundry, free continental breakfast and an outdoor pool/hot tub, at the front of the property lined by a few palm trees. There are several restaurants and gas stations adjacent. Guests at Super 8 Tucson are just half a mile from the edge of Sentinel Peak Park, which features several trails through unspoilt desert land. The affordable, exterior corridor motel is situated at the Starr Pass Blvd exit of Interstate 10, three miles west of the city center, at the edge of a residential area though also close to a few restaurants. The standard amenities of a pool, free wi-fi, free continental breakfast and basic business services are provided. The parking lot at Rodeway Inn Tucson is centered on a palm tree-lined outdoor pool, and overlooked on three sides by the accommodation blocks, which are all ground floor only. Interior amenities are free breakfast, free wi-fi and a refrigerator/microwave in all guest rooms. The motel is situated along busy Oracle Road, 2 miles north of downtown Tucson and 1 mile from the nearest I-10 exit, Speedwell Boulevard.